Two fruit beers employ different approaches. In my experience, fruit beers are probably one of the most divisive styles you'll find out there. You either love them or hate them; I only hate them when they're so damn cloying and fruity it's like choking down a glass of grandma's grape juice. The key to a good fruit beer is to showcase the fruit while letting the base beer shine. This can be done successfully with a heavy hand or a light touch, depending on the beer style. This week, I present two ales that are, respectively, weighty and feathery light in their approaches. 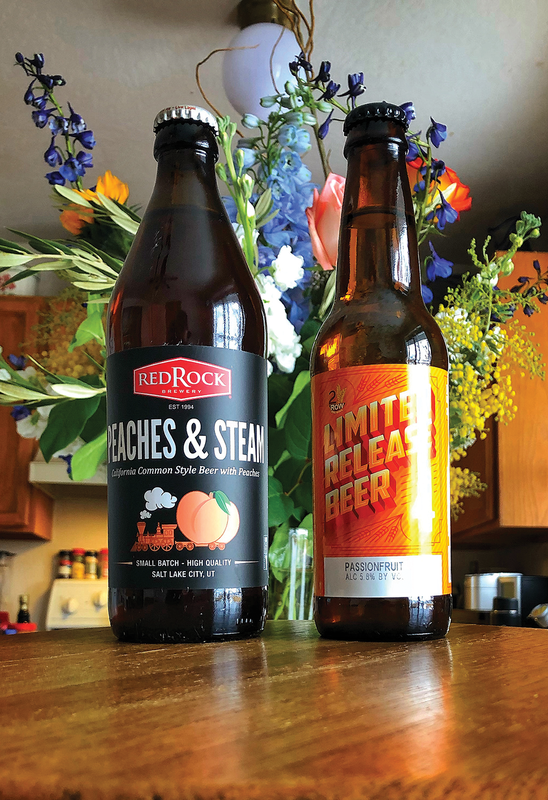 Red Rock Brewing Peaches & Steam: This pours a clear orange-amber color with a single finger of fairly dense and fluffy off-white head, which reduces to a nice, lingering cap. Spotty, soapy lacing clings down the glass; a good amount of streaming carbonation retains the cap. The aroma points toward tangerine, peach and pineapple, with lesser doses of pine, caramel and toasted biscuit. The taste begins with caramel, light toffee and toasted biscuit, which is pretty much in line with what you'd expect from a California common/steam beer. Next, notes of light peach, grapefruit and pineapple push forward; they're very light, and you might miss them if you're not paying attention. Toward the end, orange peel, pine and herbal grasses round out the flavors. The taste is still dominated by the malty goodness of caramel, toasted bread, sugar, grain, toffee and dough, while the hops become much bolder. There's a moderate amount of piney, spicy bitterness on the finish. You'll find nice complexity, with a great malt-to-bitterness balance and zero cloying flavors after the finish, and light-to-moderate dryness from bitterness as well. The carbonation is medium-high, with a medium body and a smooth, fairly crisp, balanced mouthfeel. The 4 percent alcohol is very well hidden, with zero warming effects. Overall: I have to admit I was a little hesitant when I saw "peaches" on the label, but the subtle and controlled use of the fruit added to the all-around great complexity, robustness and balance of peach and the base beer. It's a very pleasant take on the style. 2 Row Brewing Passion Fruit Sour: This beer pours a clear, pale golden yellow color, with a rather aggressively teeming tower of puffy, loosely foamy and fizzy bone-white head. It smells of pungent tropical fruit, with a bit of lactic sourness, predominant cereal malt, some understated white wine and very tame, leafy, earthy hops. The taste starts with grainy pale and wheat malt; passion fruit emerges next, with hints of mixed tropical fruits. Acidic lactic notes and domestic citrus round out the flavors with earthy hoppiness. It's easy to drink, with a nice spritzy body and feeling to it, and no alcohol warmth to speak of. The damp cereal grains are a distraction and keep it from bumping up to a higher level. Overall: A mild and interesting fruited sour beer. Not too rough around the edges, but a good starter beer for those of you that might be thinking of getting into sours, as the casual drinker can easily pick out the fruit, handle the sour and begin to search out the funkier aspects. Peaches & Steam will be floating around for a while and is available at most Harmons grocery stores and all Red Rock locations. Look for it in Red Rock's 16-ounce bottles or on draft. The Passionfruit Sour will require a bit more legwork; though it will be at your better beer pubs, you're guaranteed to find some at 2 Row's bottle shop in Midvale. As always, cheers!